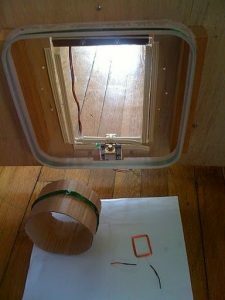 This is a cat door /flap that can only be opened by the animal that wears the appropriate RFID tag. 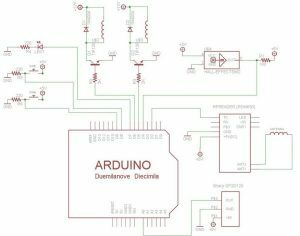 Arduino controls the process. It features a custom made antenna large enough to function as a gate, which makes it easy for the animal to activate and quite reliable. 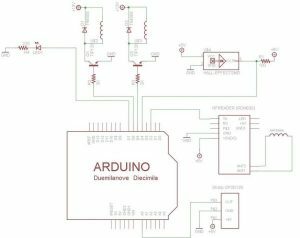 Some methods and techniques are borrowed from my previous project, the RFID cat feeder. Whereas the feeder controls access to a food bowl, the door controls access to an entire room. The latest code can also distinguish between tags to allow the system to behave differently for different individuals. RFID door (entering) from champenoise on Vimeo. 3. Door unlocks and a light comes on. 7. 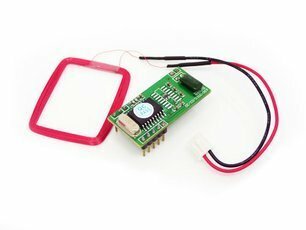 Going from the inside out, an infrared proximity sensor detects the presence of an animal if within about 10 inches and unlocks the door. Most animals will quickly learn to push the flap in response to the click (lock) and the light. Make sure that the edges of the door and the doorway are padded with soft material for when the tail gets caught! A few painful experiences may be enough to make the cat never want to go in there again. The electronics are shown without enclosure, but it is advised to put an enclosure around the electronic parts once you’re done. 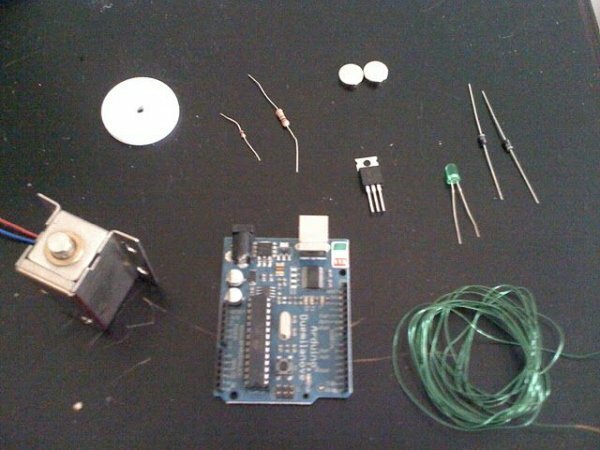 It is not further discussed in this Instructable however. – Two 12V electronic cabinet locks (Nordson electronic). Solenoids, basically. The system comprises several ‘modules’ (solenoids, RF reader, and so on). 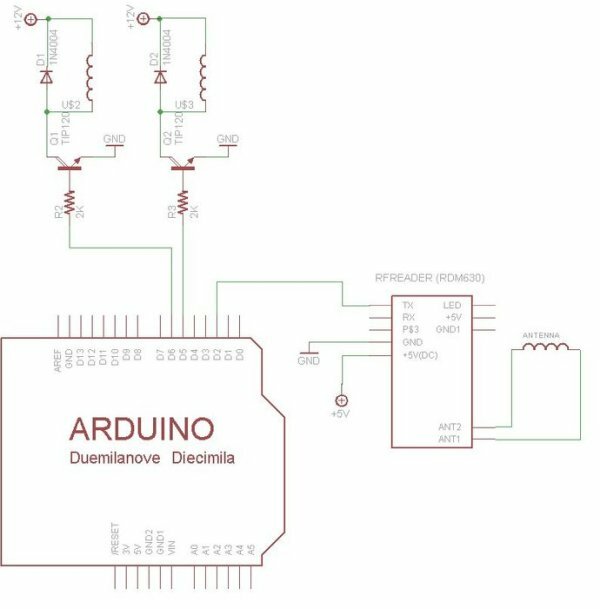 One of the pictures here shows the basic plan with the modules connected to the Arduino (the electronics). In the next steps the mechanical parts and each of the modules will be discussed in detail. Make sure that in the resting state, the flap is centered in between the two solenoids. In the picture that is in the red area around the dotted line down the middle. To achieve this it helps to have no heavy things hanging on one side, and to use a hinge with little friction. The antenna is nothing more than a coil of magnet wire connected to the RF reader. Most RF readers come with an antenna, but some allow the use of an external antenna. For this project I made a square antenna of 10 x 10 inches by winding 24 gauge magnet wire 24 turns around a sawed off bucket to make it sturdy. The distance between turns has to be as small as possible. I mounted the thing on the plywood with two pieces of wood as spacers to make it stand off from the wall a bit so the cat could activate it farther from the wall. The 35mm disc tags that I use are read up to 4 inches of the plane of the coil. 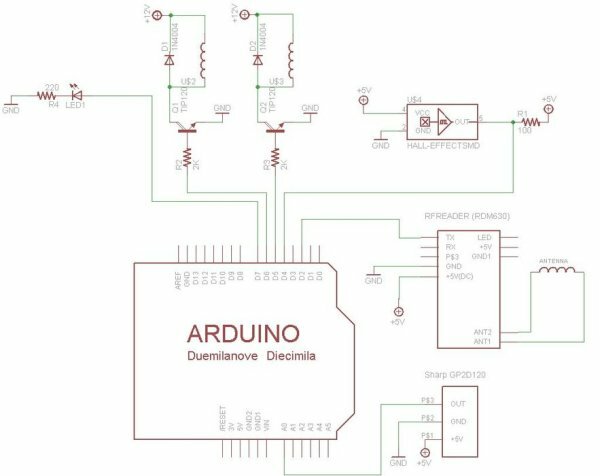 The RF reader and antenna are powered with the 5v from the Arduino. 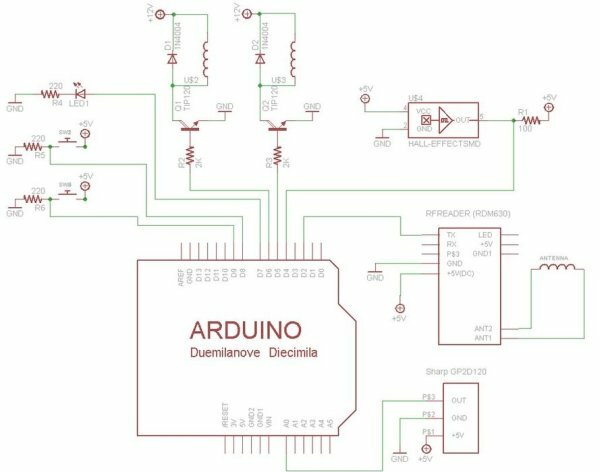 Even though the Arduino works fine with just the USB cable, the RF reader works better when the Arduino is plugged into the wall with the 9v power adapter. 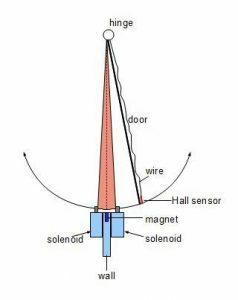 The Hall effect sensor is for detecting whether the door is in the center, i.e. within the range that closing the locks makes sense. There are other solutions possible, such as mechanical/optical rotary encoders, contact sensors, beam break sensors. 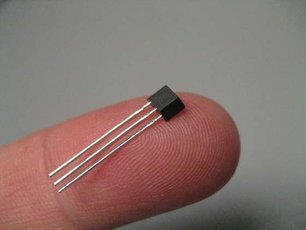 The main reasons for choosing a Hall effect sensor were that it does not add friction, it can be covered entirely, and I also was just curious how they work. I did not want to put magnets on the door because that would make it heavier, so instead I put the switch on the door and the magnets in the door post. I had to use thin, very flexible wire otherwise the rigidity of it would push the flap off center. 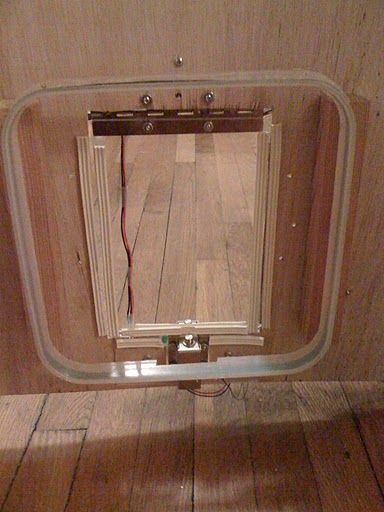 The sensor and wire is simply taped to the Plexiglas. I have two little magnets in the door post. At the closest point the sensor and magnets are 5mm apart. The range is about 3cm. Connect the signal pin of the Hall sensor to pin 4 and to through a 100 ohm resistor to 5v. 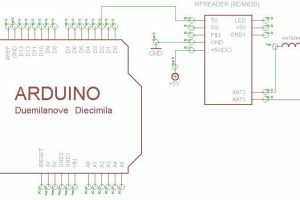 Connect ground pin to the other grounds and the vcc pin to 5v. Add an LED to digital pin 7 with the appropriate resistor (used a green one with a 220 ohm resistor). 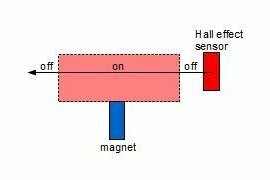 Download Hall_effect.pde to test this part of the system. For this system I only cared about which cat enters, and any creature may exit. Thus, I only needed RFID on one side. The door should open to any animal that approaches from the other side. 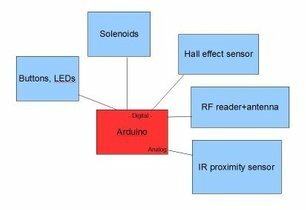 An IR proximity sensor works well. Connect the out-pin of a Sharp GP2D12 to Analog port 0, the ground pin to the other grounds and the vcc pin to 5v. 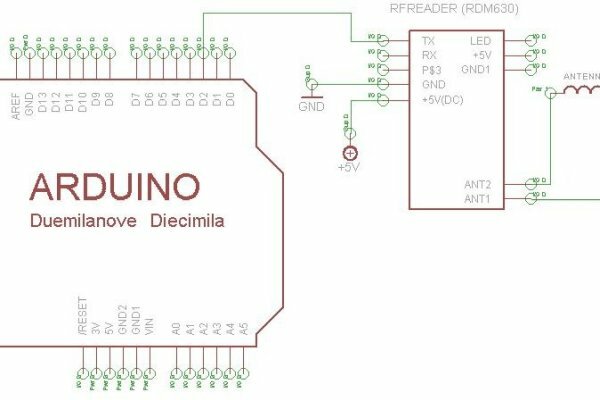 Finally you can add buttons to open the locks manually (see schematic). . In the final code downloadable here, I stored the value of two tags worn by the our animals, one with and one without access. When the animal without access tries to get in, the door is locked immediately. You have to find the code of the tags you are using and put those values into the arrays ‘goodcode’ and ‘badcode’. The values are hexadecimal which need ‘0x’ in front of it in this programming language. If you don’t want to tag the other cat, shortening the open time (smaller value for variable ‘open_time’) can help, although that puts the burden on the cat with access to respond faster. It is a good idea to put an enclosure around the electronics, but that will not be discussed in this instructable. 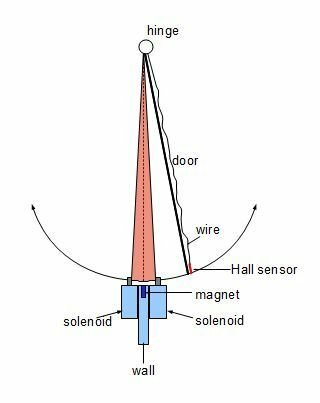 On a final note, if your antenna has a large range extending into the secured area, you may need to calibrate the positioning of the antenna and the proximity sensor a bit to make sure the RFreader is not activated from the inside. If the cat is inside and wants to go out, the proximity sensor has to detect the cat first. Once that happens, it is okay because in that part of the program, the RF reader is not checked.